Enchanted by the Highlander by Lecia Cornwall is a 2017 Swerve publication. John Erly is an English Lord, banished by his father, who has relocated to Scotland. With a wild reputation to live up to, he flirts with all the ladies, but when the beautiful, but painfully shy, Gillian MacLeod arrives, he is warned to stay away from her. But, while attending a masked ball, Gillian takes the bold step of stealing a kiss from the only man what makes her heart skip a beat. John never learns the identity of the enchanting young lady until Gillian must be escorted home for her wedding. Thrown together in an uncomfortably awkward situation, the pair finds it hard to hide their true feelings for each other. Along the way they will encounter much danger and intrigue, while falling deeply in love. But, Gillian’s father will never allow a marriage between his daughter and the rouge Englishman. Is the relationship doomed? Will Gillian be forced to marry a man she doesn't love? 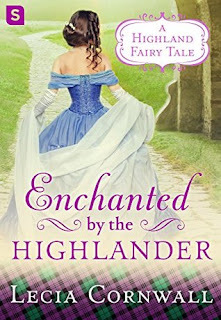 It has been a good long while since I read a rousing Scottish romance and I had begun to miss those lovely Scottish traditions and fascinating superstitions and magic, along with the action, adventure and intrigue, plus with Valentine's Day right around the corner, I'm in the mood for a little romance. This book has all those elements, along with a tortured hero, and strong female lead, who has the courage to take what she wants, to find a way to be with her true love, while remaining true to herself and blossoming into a respected heroine in the process. Gillian’s quietness is misconstrued, with people drawing the conclusion she isn’t all that bright or does not wish to contribute. Nothing could be further from the truth and she surprises even those closest to her, when she steps out of her shell, proving her mettle, and quieting those who doubted her. John’s backstory is unique, and I loved how he rose to the occasion to win Gillian, even though the odds are against him. Naturally, there are a few battles to fight and there is also an interesting competition for the right to wed Gillian, which adds a spark of action and adventure, which is essential for a traditional Scottish romance, and kept me engaged, not only in the plot, but also for the characters. 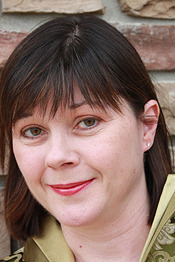 There is a fairy tale quality to the story, which keeps things light amid the danger and angst. I enjoyed the fast pace, the characterizations, and the way Gillian and John fought so hard to be together. This is a quick read, very enjoyable and is certainly entertaining. I always enjoy stepping back in time and letting myself get swept away by the beauty and tradition of Scotland, which is a nice refreshing change of pace after reading so many dark and serious novels in a row!